Hello and Happy New Year! I hope that our members and readers had the opportunity to take some time out from work and to relax over the festive period. The beginning of the new year is a good time to reflect on the challenges that face our respective agencies and the industry as a whole. We know that 2017 will be significant for aged care, with the introduction of consumer-directed care across all aged care services from this month, and important discussions taking place throughout the year about what the final reform changes, commencing in July 2018, will look like. MOD.A will be involved in discussions about changes through its membership of the National Aged Care Alliance (NACA) and directly with policy makers at the Department of Health. The National Disability Insurance Scheme (NDIS) rolls out to more participants across Australia during the year, with new areas coming under the scheme in November 2016 and again in January 2017. This includes the extension of provision to more age groups in Tasmania and South Australia. A brief update is provided in this newsletter, but there remains uncertainty about a nationally consistent approach to how complex modifications are to be provided to eligible participants. MOD.A is in the process of developing a correspondence with the National Disability Insurance Agency (NDIA) to gain some clarity about how it will operate in all jurisdictions so that services can plan ahead and be in a better position to bid for work. In addition to negotiating our members' interests through both of these momentous changes, MOD.A in 2017 will be focused on delivering its Quality Standard and in showcasing the best our industry has to offer at our annual Conference at Sydney's ANZ Stadium. We have already put the call out for abstracts and are actively working with suppliers and other partners to ensure we have an exhibition that demonstrates how effective home modifications are in assisting people to remain as long as possible in their homes. We continue to increase and broaden our membership, and my hope is that as many members as possible are able to come together in August to share their experiences as well as to hear what we can do to better promote the work we do to government and to consumers. Please enjoy our first newsletter of 2017. In 2017 MOD.A will continue to work through the National Aged Care Alliance (NACA) to develop positions about the reform of home-based aged care that recognise the benefits of home modifications and provide subsidies and incentives to encourage people to have them done. NACA continues to engage positively with the government about ongoing aged care reforms, and we anticipate that positions developed throughout 2016 will progressively be adopted and released publically during 2017. Some of these will be about the inclusion of people with special needs and from diverse backgrounds into the whole suite of services available in aged care, which in turn will inform the standards expected of all providers when they are giving information about and delivering their services. The February 2017 changes are intended to increase the control that all aged care recipients have over the care and support they receive. For home-based supports this will mainly impact on consumers who receive Home Care Packages (HCP) and MOD.A will monitor any shifts in demand for home modifications under existing funding arrangements. It is not anticipated that demand for home modifications will change as a result of this policy, due to the limited amount of funding available within HCP and the fact that most older people access home modifications through the Commonwealth Home Support Programme (CHSP). But it may be beneficial to market more directly to consumers who are recipients of HCP and who should be given much more of a say now about how their package dollars are spent. As well as contributing to the detail of reforms MOD.A will continue to have constructive dialogue with the Department of Health about issues with My Aged Care (MAC) and the operation of home modifications and home maintenance services under CHSP reported to us by members. It is clear that MAC is here to stay, and will continue to be the entry point into aged care and the main way that people will be assessed for residential or home-based supports. Our CEO, Michael Bleasdale, will be meeting with the Assistant Secretary of the Home Care Branch of the Department at the beginning of March to discuss a number of issues, including: OT referrals and other access pathway problems for home modifications; access to modifications for HCP recipients; and regulatory requirements for complex home modifications in each state and territory. If there are specific issues you want raised with the Department, or if you wish to communicate to Michael directly, please email ceo@moda.org.au. In Western Australia trials of the NDIS continue until the end of June 2017. The NDIA was in the news over the holiday period as the new Board took over the reins on 1 January, with Bruce Bonnyhady replaced as Chairperson by Dr Helen Nugent. The new board retains some important expertise in Dr Rhonda Galbally and John Walsh, but the changes were not without controversy. MOD.A members across the country, however, remain more concerned with the lack of a nationally consistent approach to the delivery of complex home modifications under the NDIS. Given the level of uncertainty we advise members to familiarise themselves with their local market by consulting information, advisories and guidelines as they become viable. The NDIA website has a section where Market Position Statements on all states and territories are published. These provide relevant statistics about the numbers of people expected to use the scheme and the increases in funding to those areas once the NDIS is fully rolled out. The long-awaited NDIS Quality and Safeguarding Framework was released by the Disability Reform Council on 3 February. The Council, made up of state and territory ministers responsible for disability issues and headed by the Hon Christian Porter, Commonwealth Minister for Social Services, announced the framework via media release. This is an important development for the scheme as it confirms the commitment to a nationally consistent approach, and establishes safeguards and a complaints system that will give greater security for participants in an increasingly consumer-driven market. MOD.A is particularly interested in the way that our proposed Quality Standard will work with the new framework. As yet there is no precise timeframe for implementation of the framework so services are to continue to operate within their state-based quality frameworks. There is a brief summary for providers available on the DSS website and there will be opportunity for further stakeholder input before the framework is finalised. 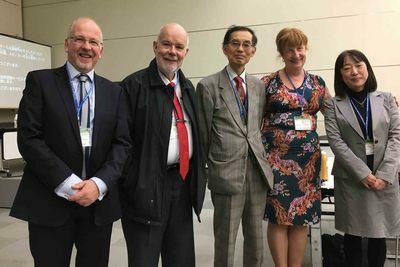 The other keynote at MOD.A's conference, Associate Professor Catherine Bridge, also presented in Nagoya, as did Dr Hamish MacLennan, Adjunct Associate Professor at the Home Modification Information Clearinghouse. Dr Bridge presented on the Centre's research on DIY home modifications and point-of-sale information to customers of common modification products in large retail outlets, while Dr. MacLennan's paper highlighted the importance of considering fire risk for older people living at home and sprinkler products that can be easily fitted to significantly reduce this risk. Some of the papers presented at the conference looked at design principles for aged care facilities whilst others focused on tourism, transportation and industrial design - issues of particular interest in Japan given the work talking place to ready Tokyo for the 2020 Olympic and Paralympic Games. The full range of papers and workshop topics can be viewed at the conference website. Overall the main focus of the conference was on design in Japan and the Asian region. Simultaneous translation of papers into Japanese, Chinese, Korean and English allowed for broad participation, and the involvement of corporations such as Toyota and Panasonic sent a strong message about the importance of inclusive design in future marketing. Innovation in technology was most in evidence in the exhibition, where Toyota was showcasing its new taxi - accessible, hybrid and modelled on the London taxi it is due for release in time for the 2020 Olympics. Their display included products from other companies that highlighted the role of technology in affording access and mobility to people with disability and the ageing, such as new lightweight scooters and home designs with low-rise steps. The Konica exhibit showcased motion-sensor technology that could identify the characteristics of an approaching individual and trigger facilities that would assist with access, such as automatically opening doors for someone using a wheelchair. Equally impressive was the compact and stylish design of the Sekisui "maturity" house, which had a regular bath in the bathroom but also incorporated a shower seat under a hand-held shower in what became, once the door was closed, a wet room. Like all good conferences this one facilitated the sharing of ideas that could be applied to home modifications and other technologies that promote inclusion. MOD.A will be seeking to build on the contacts made with individuals and companies at the conference to keep our members and those interested in home modifications informed about the exciting and innovative new products as they become available. From Left: Michael Bleasdale, Hamish MacLennan, Satashi Kose, Dr Catherine Bridge and Kazue Node at the 7th UD Conference 2016. Following the success of the Brisbane workshop on 16 November 2016 and our sell-out Sydney workshop scheduled for 15 February, Allianz Global Assistance and Home Modifications Australia (MOD.A) are proud to announce the second of our 2017 workshops has been scheduled for the Oaks on Collins in Melbourne on 22 March 2017 and the third for the Stanford Plaza in Adelaide on 5 April 2017. Using case studies to illustrate key issues and concepts, this interactive workshop focuses on best practice processes from assessment to installation and will cover legislative requirements, design principles and relevant codes/standards for both Occupational Therapists and builders working in or wishing to work in residential home modifications. This workshops will once again be presented by Liz Ainsworth, a well-respected and passionate Occupational Therapist with over 20 years' experience working in the home modification sector and co-author of An Occupational Therapist's Guide to Home Modification Practice. The Brisbane workshop was attended by 30 delegates and the audience, made up of both builders and OTs, provided some very useful and informative insights on how effective communication and collaboration between the two professions can overcome many of the challenges with home modifications. Overall feedback from the evaluation was extremely positive with 100% of respondents recommending the workshop to their colleagues. For more information on this series of workshops visit the Events page on our website. Click here to register for the Melbourne workshop or click here to register for the Adelaide workshop. Please note that places are strictly limited. Details regarding the Perth workshop in May will be announced shortly. how to report on specific items, for example, client contribution fees, sessions involving carers, meals and transport. Funding for all existing CHSP sector support and development activities will be extended for 12 months from 1 July 2017 to 30 June 2018. If you are a service provider currently delivering sector support and development activities that are currently due to expire on 30 June 2017, you will receive a 12-month extension of funding for these activities to 30 June 2018 in line with your CHSP funding agreements. Grant Agreement Managers will be contacting affected providers in the first quarter of 2017 to vary current CHSP funding agreements. For further information please contact your Grant Agreement Manager. In their January 2017 electronic newsletter, the Department of Health included a pointed reminder to service providers that they should only be delivering services to new clients where they have been assessed and referred through the My Aged Care Regional Assessment Service. CHSP funding should not be used to deliver services to new clients who have not been referred through My Aged Care, except in exceptional circumstances where direct to service referrals are required. An identified need for an immediate health or safety intervention based on the client's current circumstances. There has been a change in circumstances meaning the client cannot live unassisted and does not have access to that assistance. The services needed are one (or more) of the following: nursing, personal care, transport and meals. People needing support should always be encouraged to contact My Aged Care for a holistic assessment of their needs. This allows appropriate referrals to service providers to support the client which may include a number of services. This does not mean existing CHSP clients should be referred to My Aged Care if they are already receiving services, except where their needs change. If services have any questions regarding the acceptance of referrals they should be directed to their Grant Agreement Manager. The second round of an independent evaluation of user experience of My Aged Care's call centre and online platform will be done by external research consultancy AMR over the next few weeks. More than 2,600 surveys were due to be distributed from the end of January to a selection of aged care providers, assessors, health professionals, clients and peak bodies who have used My Aged Care in the last year. The Department of Health is seeking feedback from those invited to participate in the survey on where My Aged Care was performing well and where services could be improved. Information gathered from the evaluation is expected to inform future improvements of MAC. Following the resignation of the Minister of Health, the Hon. Sussan Ley, a limited Cabinet re-shuffle has resulted in Greg Hunt being appointed the Minister for Health and Sport while Ken Wyatt has been appointed the Minister for Aged Care and Indigenous Health. Ken Wyatt becomes the first Indigenous person to be appointed a Commonwealth minister. Mr Hunt moves to health and sport from the industry, innovation and science portfolio. He was previously environment minister. As the senior minister Mr Hunt will represent aged care in the cabinet. On 15 December 2016 Standards Australia hosted a roundtable in Canberra to discuss whether Australian Standard AS 4299-1995 Adaptable housing should be revised, withdrawn or reconfirmed following the development of a proposal submitted jointly by the Australian Network on Universal Housing Design (ANUHD) and Rights and Inclusion Australia (RIA). MOD.A attended on behalf of the home modification sector, along with representatives from the Australian Institute of Architects, Council on the Ageing, Housing Industry Association, Master Builders Association, Property Council of Australia and Rights and Inclusion Australia. Those in attendance noted the Communiqué released following the Building Ministers Forum held in Perth in December 2016, as it related to Ministers having further discussions on the costs and benefits of applying a minimum accessibility standard for private dwellings. It was also acknowledged that any work to improve AS 42991995 should be done in the context of other initiatives and programs including Liveable Housing Australia (LHA) guidelines and their referencing in some state planning legislation (i.e. NSW SEPP Seniors and SEPP 65). Could be improved usefully to support adaptable housing in Australia. Following stakeholder consultation last year, the NSW government has announced a number of changes to the HBCF that are set to commence from March 2017. The most significant changes are that base premiums are set to increase and risk rating of builders will be adopted. Members who are currently eligible for warranty insurance will soon receive advice from their broker and iCare (the Government insurer) about the new premium settings that will apply to their business. In our last newsletter we carried an item on the SWEP (Victoria) Model for Home Modifications. Based on advice received directly from SWEP we concluded that item with: "It is expected that once (the SWEP model is) live all home modifications in Victoria funded through the DHHS and non-structural modifications funded through the NDIS will be delivered via the new model." "The National Disability Insurance Agency has not appointed any organisation to develop and implement home modification services in Victoria. SWEP is a Registered Provider under the NDIS, and, subject to participant choice, is entitled to supply home adaptation and simple (standard/non-structural) home modifications." Based on this advice NDIS prescribers in Victoria are not restricted to any specific NDIS Registered Provider for the delivery of home modification services in that state. A recent article in the West Australian highlighted the importance of home modifications in improving safety and independence for the ageing. Citing recent research conducted by the Independent Living Centre WA, Curtin University and WA Home and Community Care, that found the most frequently obtained home modifications included lighting installations, facilitators to self-care such as bathroom and kitchen accessories, and things that will help mobility, the article encouraged people considering renovations to plan ahead and consider appropriate, cost-effective home modifications that can keep them living at home for longer. The article is available from our website here. The new 'How to get started with My Aged Care' brochure is aimed at older people, their carers and families before they have contacted My Aged Care for the first time. It provides an overview of aged care services and how to access them through My Aged Care and can be shared by service providers, assessors, GPs, hospitals and community organisations. To view or order the New My Aged Care brochure click here. Case study videos promoting My Aged Care are also available to share with consumers are also available here. how to create and maintain staff accounts. The guides are useful in ensuring that services give the correct information about their outlets on the My Aged Care website so that they receive appropriate referrals come through to the service. For enquiries, contact the My Aged Care service provider and assessor helpline on 1800 836 799. Did you know that 40% of all hospitalisations are for people over the age of 65? At Allianz Global Assistance we specialise in Home Modification services and have a national network of supplier and trades providers that work to provide greater safety and quality of life in the home, each and every day. Allianz Global Assistance knows feeling safe and secure in the home is key to providing peace of mind and general wellbeing to your clients. Fixing hazards, barriers or unrepaired damage around your client's home may offer great relief and helps reduce risk of accidents. Our quality-assured home modifications and repairs service helps to maintain your clients' home value and keeps them feeling comfortable and secure. If you would like further information on Allianz Global Assistance health and lifecare services visit, www.allianz-assistance.com.au. As part of our Agreement MOD.A will present a series of Home Modification Workshops in capital cities across the country in the first half of 2017. MOD.A has partnered with HR Assured to provide members with a complete workplace relations solution specifically designed for small business. All MOD.A members can benefit from the partnership with HR Assured. Not only will our members be able to access free workplace relations advice with a complimentary call to the Telephone Advisory Service but the already cost effective, subscription based pricing will be discounted by 10% (offer not available to existing subscribers). If you want to know more about HR Assured and how they can help you to reduce the costs and risks of managing your people simply call Damian Westhoff on 02 9083 0083 or 0404 557 480, email via djw@hrassured.com.au or visit their website. Please make sure to mention that you are a MOD.A member and Damian will outline the benefits and provide access to the complimentary advice call. Operational Readiness for Increasing Choice in Home Care. Webinar. 8 February 2017. 2017 ILC Grants: Strategies for Success. Webinar. 11am (AEDT) 14 February 2017. Data Exchange for CHSP. Webinar. 23 February 2017. ABCB 2017 NCC Information Sessions. Various cities, February - March 2017. These presentations are specifically designed for the practical application, clarification and understanding of the Building Code of Australia. AGA Home Modification Workshop. Parkroyal Parramatta, 15 February 2017. Australian Healthcare Week Expo. International Convention Centre, Darling Harbour, Sydney, 8-9 March 2017. Improving Quality Outcomes - The Quality Journey. Rydges, Sydney Airport, 15 March 2017. AGA Home Modification Workshop. Oaks On Collins, Melbourne, 22 March 2017. The Digital Health Show. Melbourne Convention and Exhibition Centre, 29-30 March 2017. AGA Home Modifications Workshop. Stanford Plaza, Adelaide, 5 April 2017. HIA National Conference. Hamilton Island, 25-27 May 2017. Occupational Therapy Australia - 27th National Conference and Exhibition 2017. Perth Convention and Exhibition Centre, 19-21 July 2017. MOD.A 2017 National Conference. Going for Gold: the pursuit of best practice in the age of reform. ANZ Stadium, Homebush, 14-15 August 2017. Aged & Community Services Australia (ACSA) 2017 National Summit. Cairns, Queensland, 12-14 September 2017. 7th International Carers Conference. Adelaide Convention Centre, 4-6 October 2017. National Housing Conference 2017 - Building for Better Lives. International Convention Centre, Sydney, 29 November - 1 December 2017. 11th International Convention on Rehabilitation Engineering and Assistive Technology (i-CREATe2017). Kobe International Conference Centre, Kobe, Japan, 22-24 August 2017.